When I became a stay-at-home Mom, lunch took on a whole new meaning. On one hand, it was awesome – I wasn’t restricted to 30 minutes with only a microwave for cooking. I could use a stove! Any ingredients I wanted! I could eat whenever! It was all fine and good until I found myself with 2 screaming kids who also wanted to eat and a menu that basically varied between taco bell and peanut butter sandwiches. Something had to change. Once I had my head above water with 2 kids, I made an effort to improve my lunches. It’s nothing fancy – typically a wrap sandwich, salad, leftovers, etc. This tortellini salad is a great lunch option whether you work or stay at home. It’s good cold and actually improves during it’s time in the refrigerator. You can add or subtract anything from the recipe – depending on what you have. I like to make a big tupperware full of this and eat a bowl for lunch every day. As the dressing soaks into the veggies and pasta, they get better and better. 1. Boil the tortellini according to package directions, but subtracting about 20% of the cooking time (if it says 10, only go 8). Half the cherry tomatoes, chop the cucumber, kalamata olives, and onion. 2. Whisk the olive oil, red wine vinegar, garlic powder, and oregano. 3. Run the tortellini under cold water. 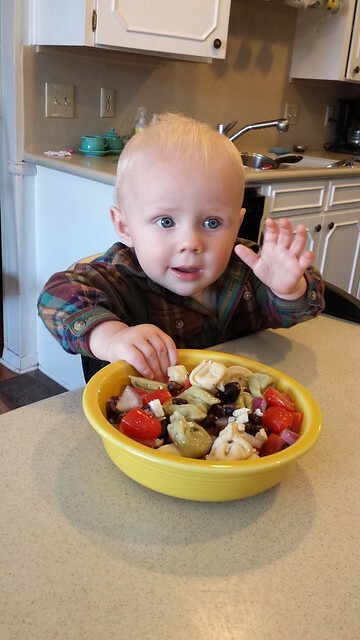 In a large bowl stir the tortellini, olives, tomatoes, cucumber, onion, and crumbled feta. Pour the dressing over the top and toss to distribute evenly. Chill before serving.